A plate to win is a plate with doughnut. 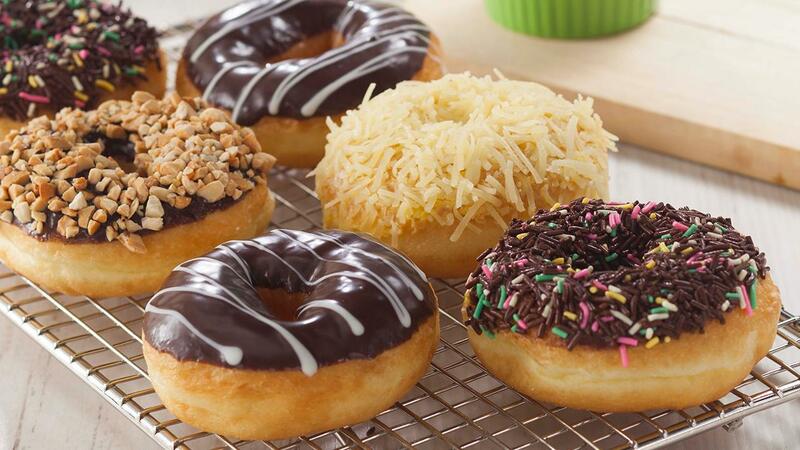 Make your guests craving for more with this doughnut recipe. Mix all dry ingredients, unless salt, beat in the eggs and water until congealed. Add margarine and salt and mix until the dough is dull with maximum temperature is 28°C. Rest the dough for ± 15 minutes, cut, weigh, and round the dough. Rest again for 15 minutes, shape and arrange on a loaf, store in a proving box, wait for ± 60 minutes until the dough rise. Heat oil ± 170°C then fry on both sides until done.